Everyone knows about Audible, the audio book subscription service at audible.com. For $14.95 per month, you get one audiobook and 2 “audible originals”. It’s a great service for people who don’t have time (or don’t want to take the time) to actually read a book. You can listen to a popular or best-selling book while doing something else, just like many people do with podcasts. But what if you don’t want to pay $14.95 per month? What if you don’t want to pay ANYTHING per month? 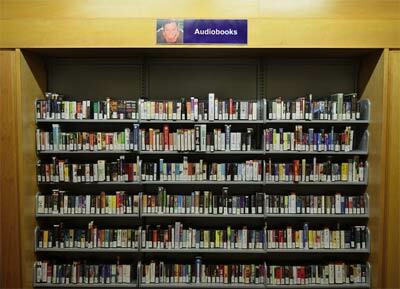 Turns out there are still some great options for you to get your audiobooks. If you’re in the US, I think this is service is really amazing. All you need is a library card for your local library, and an app on your smartphone called Overdrive. 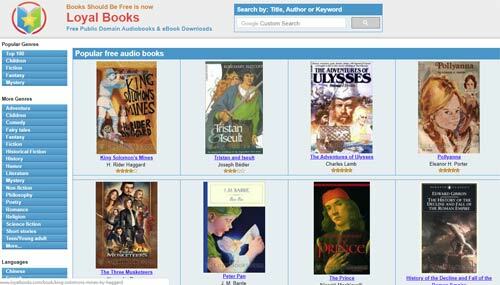 With this service, you have access to hundreds of audiobooks, many of them best sellers, from all categories. Seriously, if you have not yet checked this out, you need to go to the website, get the app, and start listening. 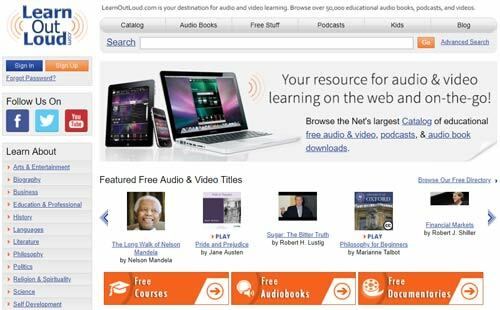 Another great resource – this one focuses more on audiobooks that are oriented toward some type of instruction or learning. You can choose from almost any category you can think of, based on what you want to learn, and it’s probably there. And all free. For this one, the content is a little different from the previous two services. 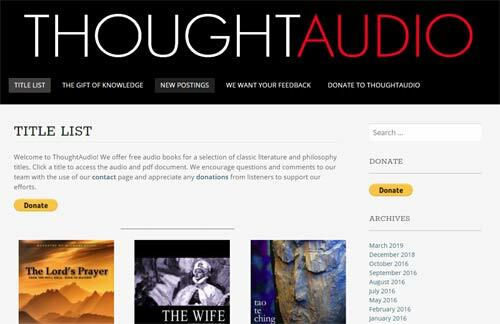 ThoughtAudio has audio books that are more in the areas of classic literature and philosophy, rather than modern day books. Not quite as large a selection here, but if you ever get the idea that you want to read something classic, like The Art of War, it’s here for you to listen to! And here’s one for the kids! 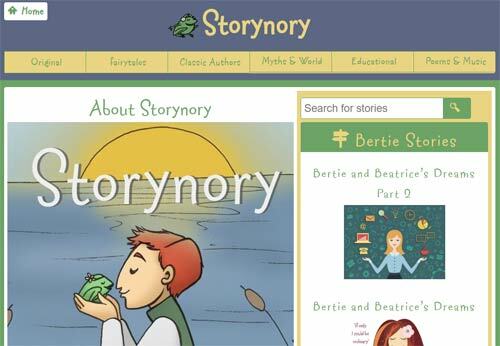 Storynory has been around since 2005. They have a podcast and also audio streaming from their website. Lots and lots of content here for a younger audience, with a lot being original stories by the site’s owner, Hugh Fraser. Everything here is free. Lately, they have focused a bit more on factual content, including history and interviews. The idea is to stimulate kids’ curiosity about the world – nothing wrong with that! Obviously you’ve heard of the BBC. It’s a worldwide presence and has been putting out content to listeners since way back in 1922 when it was founded. I kind of think of the BBC as “the NPR of Europe” even though with the internet and podcasts, geographic designations don’t really mean much any more. 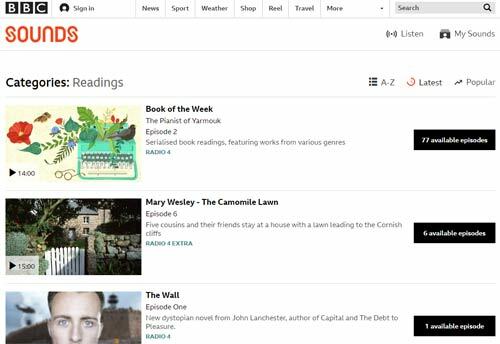 The BBC offers a LOT of audio content, from a variety of authors, as you’ll see when you look at the site. One that looked particularly interesting was “Blackwater” – a multi-voiced dark story about secrets and lies in a small town. And finally we have Loyal Books. Their philosophy is “Books should be free” – an idea that might be a bit impractical overall for the publishing industry since people need to be paid for their work. But regardless of that, almost all the audiobooks and e-Books on their site are indeed free. Many are classics that are in the public domain, and there is almost certain to be something of interest for everyone here. They also include content in LOTS of different languages. 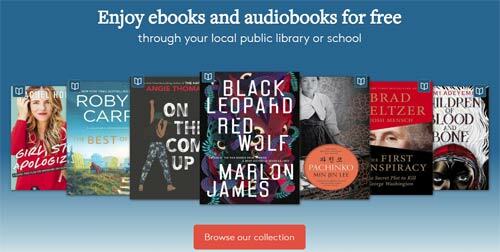 Do you have a favorite site to get free audiobooks that I overlooked in this list? Tell us about it in the comments below! Thank you. That is very helpful and interesting. I’ve been meaning to try out an audio book but have never wanted to subscribe. The last one I listened to was on cassette and was being passed around the office with about one lost cassette per listener so the final person ended up with about half the book, one of Tom Wolfe’s long ones, as I recall. I think I’ll check out the BBC first, big fan. Try LIBBY by Overdrive. The checkout and return is much easier.